Geneva – Marking the 20th anniversary of the Guiding Principles on Internal Displacement, the UN Migration Agency (IOM) launched the ‘Holding On’ digital campaign yesterday (15/11) to raise awareness of the plight of internally displaced persons (IDPs) and celebrate their courage and resilience. Holding On showcases the stories of internally displaced persons by asking them to reflect on their most cherished possessions. Global audiences can now share these stories on social media via the #HoldingOn hashtag. They can also sign a petition that calls on states to respect and advance the Guiding Principles, which Cecilia Jimenez-Damary, the UN Special Rapporteur on the Human Rights of IDPs, will use in her work. The Guiding Principles serve as the global standard for States regarding the protection and assistance of internally displaced persons. Displaced within the borders of their own countries, IDPs are among the world’s most neglected – often denied access to education, employment, safe accommodation and other human rights. Twenty years on, internal displacement continues unabated around the world with 40 million people displaced in their own countries by conflict and violence as of December 2017, which accounts for 62 per cent of all conflict-induced displacement. The number of IDPs has nearly doubled since 2000, increasing sharply over the last five years. In addition, a further estimated 26 million people are displaced annually due to natural disasters. “Internally displaced people have left their homes on their own. They don’t have anything other than what they’re carrying. Our exhibition shows people who just walked out with a t-shirt or only holding their children in their arms…That’s all they have,” said Mohammed Abdiker, IOM Director of Operations and Emergencies in the United Nations podcast, A Way Home Together: Stories of the Human Journey. The items IDPs carry with them when they flee often become physical representations of a world that has since disappeared. As simple as a camera, t-shirt or small bird, these items represent symbols of struggle and hope. “This camera carries a lot of memories. I used it to take pictures of my children at home. We used to go north to picnic and these cameras were always with us. We took pictures and video footage that I still keep as memories,” said Moafaq, displaced in an emergency site in Iraq. 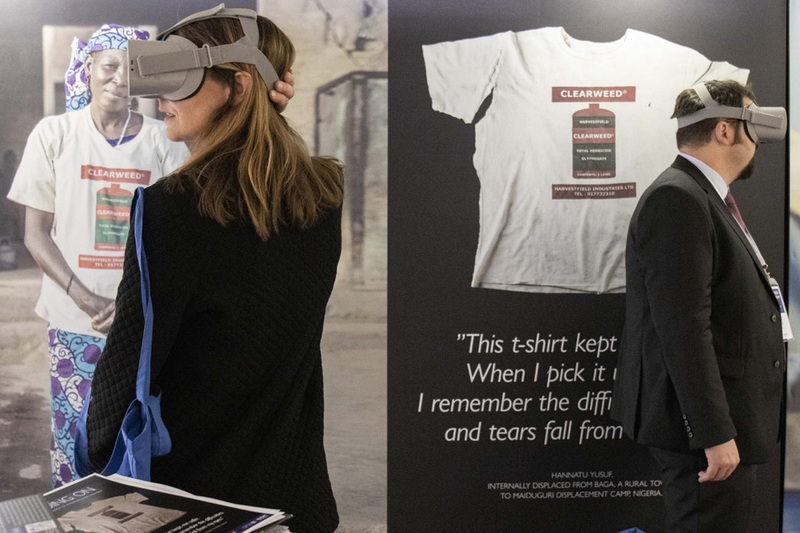 The exhibition’s virtual reality (VR) films reanimate the lives of IDPs in Colombia, Iraq, Nigeria, the Philippines and Ukraine. 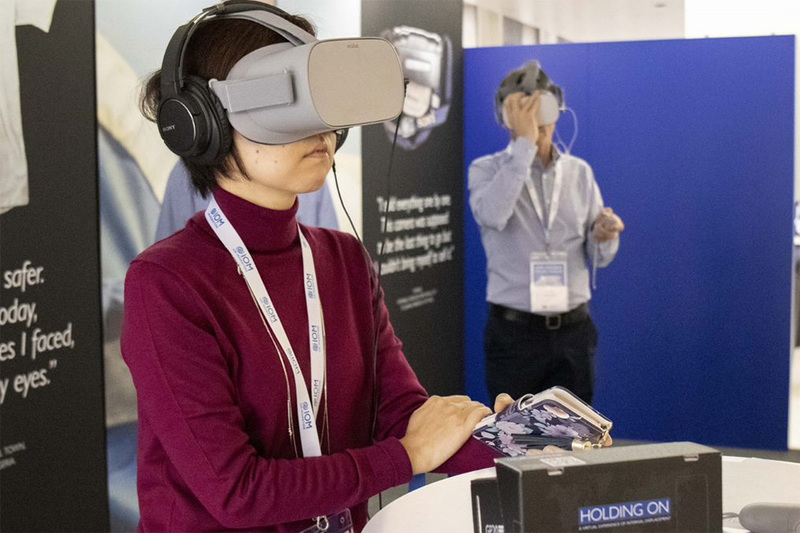 Since July 2018, IOM has held ten exhibitions around the world including in Switzerland, the Netherlands, Belgium and Djibouti. Conventional videos that do not require VR glasses, as well as feature and photo stories, are now available on the campaign’s website, allowing people an intimate view into the lives of others who remain displaced. Upcoming exhibitions will be held during the IOM Council in Geneva between 27-30 November, the opening ceremony of the Global Migration Film Festival (GMFF) in Geneva on 28 November, and on International Migrants Day in Cairo on 18 December.